Through the joy of gift certificates and discounts, I was able to see three of this year's holiday movie offerings. I finally took in The Muppets, Sherlock Holmes: Game of Shadows and Young Adult. Thanks to our holiday cinema surplus, we're also planning to see the latest Mission Impossible. 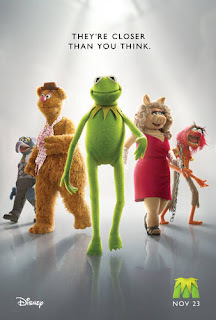 As for The Muppets, I ignored all press before seeing the movie. I felt happy just to see them onscreen again. But I can understand some of the reactions of the dissatisfied. While watching, I felt we weren't seeing the real Muppets. Rather, just another show they were putting on together. I imagined them calling cut and all the Muppets hanging out together at craft services between takes. Because if this, I didn't have that same visceral "Kermit wouldn't live alone in a mansion!" kickback that many others did. I did tear up at most of the Jim Henson references. I was kind of expecting Steve Martin to pop up at some point and I did cry like an emotionally unstable little baby (Are there any other kind?) when they started singing, "It's time to start the music..."
I feel like a lot of people were unprepared for the small scope of the movie. But if you look back, lots of Muppet movies are like that. Maybe they only felt bigger when we were kids. I liked the focus on the show, the theater, the juxtaposition of that trademark Muppet optimism vs. the gritty reality of show business. I did find it bold and ironic that the villain of the movie sort of threatens to do exactly what Disney has already done, buy the Muppet name and merchandise it into oblivion. Maybe it's because I saw it on Christmas night. Maybe it's because I was with good friends. Whatever the reason, I was able to relax and enjoy. I was also able to understand Frank Oz's script frustrations. Though, I think way too much was made of his few public sentences about why he didn't want to be involved. Can't we be forgiving of the pioneer who maybe just didn't feel like working with the material again? The truth is, they'll never be the same as they were when they were in Jim's hands. If you can let that go, you can and will enjoy The Muppets. 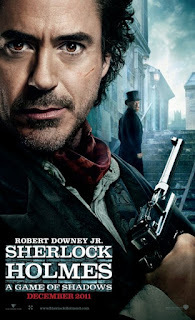 Sherlock Holmes: A Game of Shadows was fantastic. As a lover of the original Sherlock stories, I've enjoyed the recent Sherlock resurgence. Though Sherlock is so frequently portrayed, I guess it's unfair to call two movies and a BBC series a resurgence. The master detective is always around, isn't he? Because it's classic fiction, it's open to reinterpretation. Fair game, I say. It's why I never have a problem with multiple comic book movies. Classic characters belong to all of us now. The more interpretations we see, the better. Film is a medium custom made for new visions. Storytelling itself has always been about sitting around the fire and listening to this person's version, if that makes sense. Game of Shadows was all fun, all the time. A modern take on an amalgamation of classic stories done in Guy Ritchie's signature style. The sequel followed the golden rule of amping up the action, the pacing, the jokes and the stakes. The Roma culture was portrayed colorfully and real Roma music was used during their scenes. This is one I'll see again if I have the chance. More than a few of us giggled like nerds when first mention of "Reichenbach Falls" was made. We knew what was coming. I've talked about this before, but I belong to a women's critical association, the WFCC. At this time every year, the WFCC's award results are released and inevitably, every single year, major drama unfolds following the release. Comments sections blow up. Sentiments of "Oh, they just don't get it," resound across the internet. Plenty of critics associations release their rewards this time of year. It's right before the official award season begins. And to be fair, awards will always draw ire. Awards themselves innately mean there are losers and there's nothing more fun for movie geeks than to argue with each other about movies. It's what we do. It's who we are. So some drama is to be expected. That's fair. Amid the dozens of critical associations, the WFCC seems to draw the most wicked barbs. Why? Because all the critics are women. Despite the fact that ever since film has existed, the majority of critics and critical associations have been comprised of men, there's something really rage-inducing for some about the fact that a group of women would come together to give out their own awards. How dare we, right? I never hear the same complaints about Siskel and Ebert. NOBODY ever says, "Oh, they're just giving that a thumbs up because they're men!" And yet, that's the majority response the WFCC awards generate on the internet. Of course, it's more complex than that. A good way to introduce you to the drama would be to give you a way in. This year, there's been a lot of disagreement over a couple of specific nominations. Over a week ago, I started to get the arguments in my inbox over "Young Adult". There's a "Worst Female Images" award given out by the WFCC every year. This film was nominated and several members of the WFCC disagreed with that nomination. It did not win the award. In my opinion, that's a big relief. Charlize Theron's character, Mavis, as written by Diablo Cody and directed by Jason Reitman, is essentially unredeemable. Or rather, she chooses not to seek redemption. She goes through, what for any other person, would be a life-changing mental breakdown. A long-time-coming moment where she could confront ghosts that have been haunting her for years. Mavis is also a raging alcoholic. She admits it out loud at one point. She drinks CONSTANTLY in the movie. As I processed the film after watching, what struck me was that this was a character deep in the throws of her alcoholism. She's quite ill. Is she superficial? Yes. Is she nasty? Very much so. She's a character in crisis, but she's also a character in denial. One of the major symptoms of that disease. I always ask myself after seeing a movie, what did that movie have to say? What was it really about? Immediately following the film, my knee jerk reaction was, "This movie has nothing to say." It's because I was mad at Mavis, angry at her treatment of Patton Oswalt's character. But I couldn't have been more wrong. What I was feeling was the weight of effective storytelling. GOOD writing from a literary point of view where there wasn't a happy ending. But I can understand the feeling of frustration the story evokes and how it might lead a female critic to nominate it for Worst Female Images in the heat of the moment. But unlike many frustratingly sexist movies, Mavis is not the only woman in the film. There are four well-balanced, quirky, interesting young mothers who have their own band. They have complex, mature relationships with each other. They show pity to Mavis in the face of repeated provocation. There are two older mothers of adults who can see Mavis' breakdown coming a mile away. They try to help her. There's a best friend at the very beginning of the film who looks at Mavis through nervous eyes, even as she sees the storm clouds of crisis gathering. In addition to that, there are several side characters of both genders that are funny, real, and like most humans, complicated. To me, Worst Female Images in movies should be reserved for one-dimensional or achingly stereotypical portrayals. There's nothing one-dimensional about any of the characters in Young Adult. In fact, the story is more slice-of-life and well-layered than most movies are even willing to try for. Don't we want to see women in all kinds of roles? Shouldn't we want to see heroes and villains and everything in between? Some of the most insulting, simpering female characters I watch are in big shiny romantic comedies. Is Mavis a good, moral character? Absolutely not. But good, perfect, moral characters don't make for very entertaining movies, do they? Mavis is only one of two women in the film who seems unwilling to confront reality. That's what makes her so interesting to watch. She's a mess. A train wreck. The other is Matt's sister, who has obviously harbored an obsession for Mavis. Upon seeing her for the first time in years, she gets giddy excited. She reminds Mavis that she once baked her Rice Krispies in high school, and then demands praise for such a simplistic action twenty years later. Clearly, she still wants to be one of the cool kids. Every other woman in the film has a firm grasp on her sanity. But we need a character like Matt's sister. We need to understand the kind of power and sway Mavis held in high school and this woman helps us gauge that. "Young Adult" ends with an eerily perfect song. "When We Grow Up" by Diana Ross can be taken one of two ways. The repeated strains of "I don't have to change at all," are sort of left to the viewer's interpretation. What Young Adult wants to tell us is, not everybody makes the choice to grow. Not everyone chooses to better themselves or put others first in a relationship. In other words, this movie tells us an uncomfortable truth and holds a mirror up to the realities of vanity, self-centeredness and alcoholism. (Not to insinuate that alcoholism is like a personality disorder.) It serves a different purpose than a populist, escapist, feel-good romantic comedy. And to me, that's okay. Because not all movies have to serve the same purpose. I'd like to see Young Adult embraced by audiences. The years will be good to this movie and critics will be embarrassed at their negative reactions. I hope. But for you audiences out there, it's okay watch a movie that challenges you. Ideal, actually. Watch a movie that makes people argue. Watch a movie that forces you to think after the credits roll. Diablo Cody wrote a stunning screenplay, one that almost purposefully seems to, at first glance, plant some misdirected clues. (Mavis is recently divorced, Mavis pulls her own hair out of her scalp, Mavis watches nothing but "Keeping up with the Kardashians", Mavis impulsively drives back to her hometown because she wakes up feeling blue one morning, Mavis dresses purposefully provocative.) At the end of the film, these small mentions and glimpses of things add up to one big "a-ha". The haze of alcohol. All the loose threads can be explained by Mavis' drinking problem. The mystery is so subtle, so literary, that it almost beats Sherlock Holmes. The last conversation Mavis has in the film is with Matt's aforementioned sister, the only person in town who is still desperate to win Mavis' approval. What Mavis needs is someone to tell her the truth, that she has no right to look down on the people of her small town. That she is cocky and self-deluded. That she can change and have a more fulfilling life if she'll stop looking back, Uncle Rico style, to what she thinks were her glory days in high school. Instead, Matt's sister enables Mavis, tells her she is awesome. That the people of Mercury are so inconsequential, they might as well die. She tells Mavis she lives in a cool place, she has a cool job and she has shaken the dust (and losers) of her hometown off of her metaphorical boots. Mavis thanks her and says, "I needed that." When Matt's sister asks Mavis to take her back to Minneapolis with her, Mavis turns to her and says, "No. You're good here." Essentially condemning her to death. This reaction tells us Mavis will return unchanged. She's going to retreat to the idea that life is like high school and she came out on top. She'll never confront the realities of her depression or alcoholism. This is the dramatic equivalent of the killer popping up at the end of the story and finishing off the last survivor. It's not a happy ending. But it says a lot more than a happy ending would have. And let's face it, we all know a Mavis or two. We encounter them at our high school reunions. We meet them anew in our everyday lives. There will always be people who never see themselves as the villain, even as they perpetuate everything from minor selfishness to horrific crimes. There's always someone who thinks they are vastly superior to everyone around them. Mavis sees herself as the heroine of one of the young adult fiction books she pens instead of the broken human being she has become. Whether Mavis was a narcissist, an alcoholic or both is up to the viewer. Young Adult offered me the diversity of female characters for which I've always begged. More than that, it gave me something different. For that reason alone, it deserves an award. What did you see over the holidays? Better yet, what's the last movie that made you angry and why?